Since Venom is always getting dragged into crossovers, one after another, there’s usually a one-off story to fill the space between when necessary. They’ve been better than I had expected at advancing relationships that have existed for years and even introducing new ones. It kind of makes me wish that writer Mike Costa weren’t so intent on playing the long game and would commit to what he’s been doing better overall. Venom #161 definitely shows his strengths. Spoilers below. 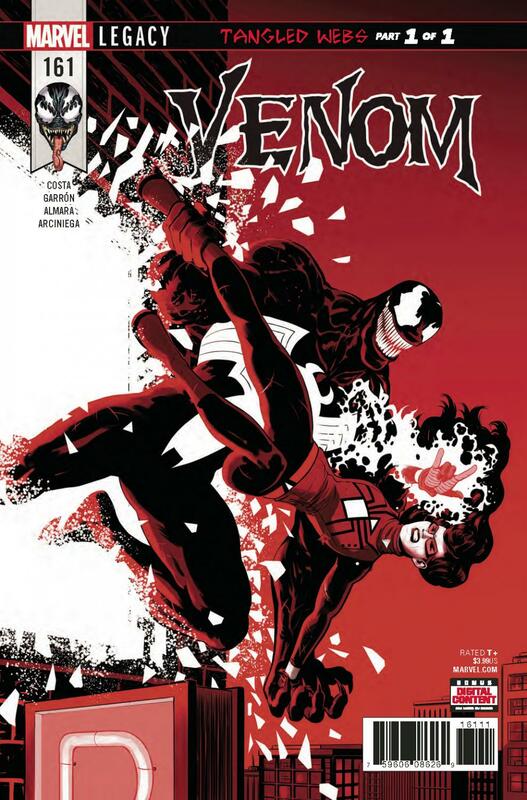 The premise of this one off is pitting Venom against Spider-Woman, something I’m surprised hasn’t been done before. Eddie and his partner seek to prove themselves yet again after discovering that they’ve been cured of Eddie’s symbiote-resistance and the symbiote’s…craziness. The revelation of the cure is pretty underwhelming when you consider how long they’ve been dealing with the illness, but I’m sort of just happy we won’t have to deal with it anymore for the sake of making Venom more like his 90’s self. So, out on the prowl for justice, we get a pretty bad, “lame bad guy peed himself,” joke. Additionally, they run into Spider-Woman by complete coincidence. Her reason for fighting Venom is pretty simple but makes enough sense. What caught me off guard in this issue was the resolution to their conflict. This issue highlights the symbiote’s vulnerability and plays that up to gain Jessica’s sympathy, while also planting a seed of distrust between Eddie and his partner. It’s unexpected development like this that makes me wish we had more of these stories. It’s not the most substance of any comic but it’s certainly got more weight to it than other Venom stories under Costa’s pen thus far. Artist Javier Garrón and colorists Dono Sánchez-Almara & Erick Arciniega clearly have a lot of fun in the playground that is a Venom book. I’m not a fan of him depicted with eyeballs, but I love everything also about the life that they’ve breathed into this story. Movement is easy to follow by simple but correctly placed lines. Faces are way more expressive than you usually find in a “traditional” looking comic book, and they all have unique structures that make them easily discernable. I’m not mixing up Jenn Kao and Jessica Drew, and I wish I could say that more often. And when the symbiote bonds with Jessica, there’s a phenomenal splash page of her being bombarded with visions of its past with Eddie. It beautifully compliments a climax that chooses character progression over action in a way that I think all readers of this book will find refreshing.